As I was writing a review for Upstairs Mouse, Downstairs Mole by Herbert Wong Yee, which is dedicated to friends of Frog and Toad, I realized that, even though most everyone is familiar with Frog and Toad, I mention them so often in reviews that they deserve their own review/tribute. Arnold Lobel is an author, illustrator, Caldecott winner for Fables in 1980, Caldecott Honor winner for Frog and Toad are Friends, and a Newbery Honor winner for Frog and Toad Together. He was also married to the colorfully unique illustrator and author, Anita Lobel and they collaborated on the Caldecott Honor winning ABC book, On Market St Like James Marshall, Lobel died at a young age and left a relatively small library of books behind. There are less than twenty books written and illustrated by Lobel in print today. 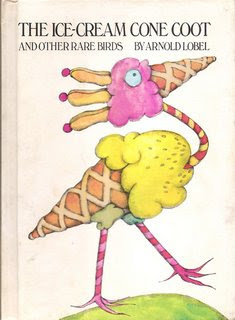 Besides Frog and Toad, two of my favorites that are seared into my memory from childhood are The Ice Cream ConeCoot and Other Rare Birds and Miss Suzy, which was written by Miriam B. Young. Miss Suzy is still in print, but The Ice Cream Cone Coot is not. You can, however, see some brilliant illustrations from it at John Rozum's blog. Why have Frog and Toad had such staying power for over almost forty years now? And which one is frog and which one is toad? This is how I remember them - Toad is the neurotic, self-centered one and Frog is the calm, thoughtful one. I guess you can also tell them apart because Toad is short and brown and Frog is tall and green. They are opposites of sorts. Not exactly the black and white, good and evil forces from fairy tales, but resonant in their amphibian-ish humanity. Toad learns the lessons of an unfair, random and sometimes cruel world and Frog stands by, helping Toad through his his dilemmas and difficulties, sometimes giving him the extra push he needs. In fact, many of these stories remind me of Buddhist teachings. One teaching is, learn to live with uncertainty. In Frog and Together, the story A List depicts a desperate Toad faced with uncertainty. Toad happily spends the morning crossing off things from his "list of things to do today," but when he loses his list while taking a walk with Frog he becomes frantic. He can't even look for his list because that was not on his list of things to do. Toad sits and does nothing in the absence of his list until. it grows dark and Frog urges him to go to bed. Toad then remembers the "go to bed" was on his list of things to do and he returns home happily. Another teaching, the cause of suffering is desire, could be the theme of the story, Cookies, also from Frog and Toad Together. Toad bakes up some delicious cookies that he shares with Frog. The two quickly realize that the cookies are so good they cannot stop eating them, but they know they will become sick if they eat too many. Frog tells Toad that they need will power. "What is will power?" asks Toad. They then try putting the cookies in a box, but they can open the box. They tie string on the box, but they can untie the string. They move the box to a high shelf, but they can reach the shelf. Finally, they agree to divest themselves of the delicious cookies and end their suffering by feeding them to the birds. I could go on and on with the comparisons, but I will stop here to sum up my admiration and appreciation for the existence of Frog and Toad in this world, especially the world of beginning readers, by calling attention to the genius or Arnold Lobel. He was a man who was able to work in miniatures. He could take a huge theme like desire, whether intentionally or not, and shrink it down to the size of a cookie. And relate it in a way a child can grasp. And throw in some pretty great illustrations as well. And that, I think, is why Frog and Toad are not only on the shelves at the bookstore to this day, but their wooden effigies are climbing ladders, decorating the entrance to the children's department of bookstores across the country! Lobel's other books in the I Can Read Series include: Owl at Home, Grasshopper on the Road, Uncle Elephant, Small Pig, Mouse Soup and Mouse Tales. And, of course, Lobel's Caldecott winning Fables and Caldecott Honor winner illustrated by his wife, Anita Lobel, On Market Street. Nice review. I had never thought before about the Buddhist teachings in Frog and Toad. Thank you for pointing them out. I'd like to add that Lobel's Mouse Tales is another great story anthology for early readers. Thanks for your kind words and thanks for reading! I can't believe I left out Lobel's Mouse Tails!! That will be edited in asap!